Anushka Shetty is a Mangalore-born actress who works in Telugu and Tamil films. She is 32 years old and has a Bachelor’s degree in Computer Applications. 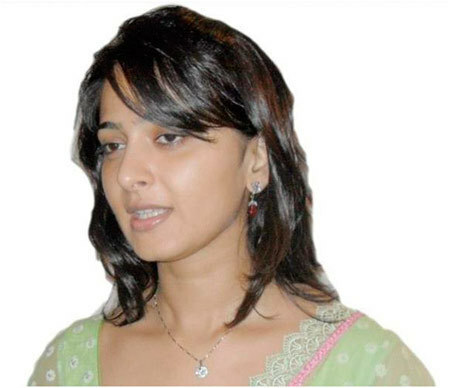 You might be interested to know Anushka is not her real name; her off-screen name is Sweety Shetty. This 5’ 6” tall actress is most known for her role in the movies Don No.1, where she acted along with super star Nagarjuna and actor-model Kelly Dorji and Arundhati, where she was the main protagonist. This movie was later dubbed in Hindi. 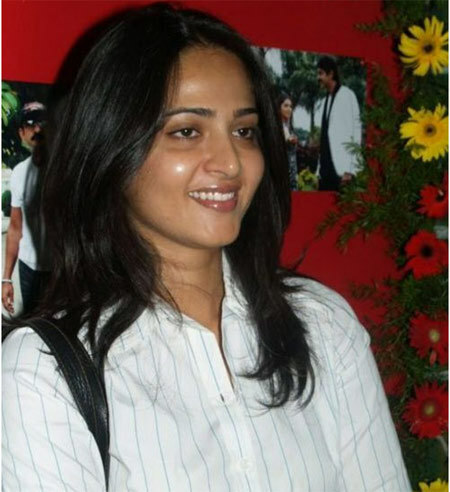 Anushka often attends promotional events with little or no makeup. Here are some of her pictures. Unlike many other actresses, you can see that Anushka looks good – with or without make-up. There is something very natural about Anushka without makeup that makes her look good either ways. Here are the top 10 photos of Anushka Shetty without makeup. The picture above is for your comparison. The picture on the left is where Anushka does not wear makeup and the one on the right side is one where Anushka wears makeup. See how her skin tone differs in both, plus how her features look more defined with makeup. This is Anushka Shetty’s no-makeup look, if you excuse the clear lip balm. I guess clear lip balm doesn’t even count as makeup. Her hair complements her dewy skin, and looks superb. The above picture is my favorite. She looks absolutely stunning here. I love her haircut and that top goes very well with her jet black hair. Her skin looks really fresh, and so clear. This picture of Miss Shetty was taken at her house in Mangalore. By the way, did you know that her brother is a cosmetic surgeon? Perhaps that’s the secret of her wonderful skin. There’s nothing like an in-house doctor. This picture is the oldest picture of hers in circulation. I don’t have a date to it, but the outdated necklace and T-shirt proves it. A close-up shot of her face with no makeup. The mehendi pattern that decorates her hand makesher look even more beautiful. But her hair looks a bit greasy. I guess Miss Shetty forgot to wash her hair before stepping out or maybe she just ran out of time. Her expression and the mehendi are what give the picture a thumbs-up. In this picture, if you notice closely, her nose looks a bit leaner. May be she has undergone rhinoplasty (nose surgery). I bet we’ll never know. Stars so closely guard their plastic surgery to prove they are naturally beautiful. And her brother being a cosmetic surgeon could guard the secret so well. I guess they should take a clue from Sushmita Sen who openly admitted to having breasts implants done. Anushka looks pretty in a yellow and brown cotton salwar suit. She looks really good in Indian traditional wear. She looks cool, and makes a good choice of material for summers, as cotton fabric helps your skin breathe. A picture of Anushka Shetty in a white collared T-shirt and no makeup. Her forehead looks shiny. I bet we are not the only ones combating our oily and combination skin types. I am sure she too has bad-hair days and so on. Her lips could have used some colour though. Even with no makeup, Anushka looks pretty and cute here. And her jhumkas are just breathtakingly beautiful. I personally do not prefer jhumkas but this one is an exception. This hairstyle with side bangs hides her huge forehead well. What a stunning picture this is! And we have one last picture of actress Anushka Shetty looking really cute and elegant here. The maroon kurta and the white stud earring look perfect on her and of course complement the other. Anushka Shetty looks pretty captivating in any picture. She really doesn’t need makeup to look pretty. And unlike other modern misses of the silver screen, she can carry off Indian dresses to the hilt. It’s no wonder she is a rage among the youth. 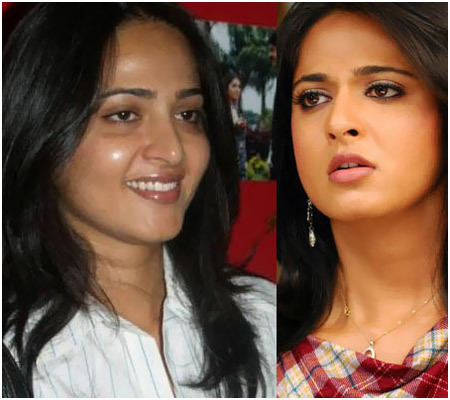 So what is your take on these Anushka Shetty photos without makeup? Do leave us a comment!